Hunter Engineering Company is a leading manufacturer of automotive service equipment. 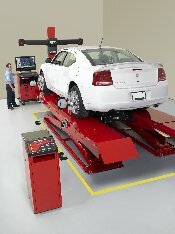 Headquartered in St. Louis, Missouri, Hunter Engineering Company sells state-of-the-art wheel alignment systems, wheel balancers, brake lathes, tire changers, lift racks and brake testers. Hunter equipment is approved and used by vehicle manufacturers, automobile and truck dealers, tire dealers and automotive service facilities around the world.